Here are some resources to help ensure you’ll be able to vote in the November 7 election. If you have additional questions, please don’t hesitate to Contact Allison. Can YOU vote for Allison? All voters who live in Newton Ward 4 are able to vote for Allison on November 7. If you live in Newton but are unsure of your ward, use the Mass Secretary of State’s easy, online form to find your ward. If you are unsure whether you’re registered to vote or whether you’re registered at your current address, you can quickly and easily check your registration status online here. You can register or update your registration online here if you have a valid driver’s license or identification card from the MA Registry of Motor Vehicles. Alternatively, you can register in person at the City Clerk’s Office at Newton City Hall. The registration deadline for the November 7 election is Wednesday, October 18. You (or a family member) can request an absentee ballot in person at City Hall or by downloading an absentee ballot application from the City Clerk’s website. Your completed ballot can be returned by mail or in person until Monday, November 6 at noon. 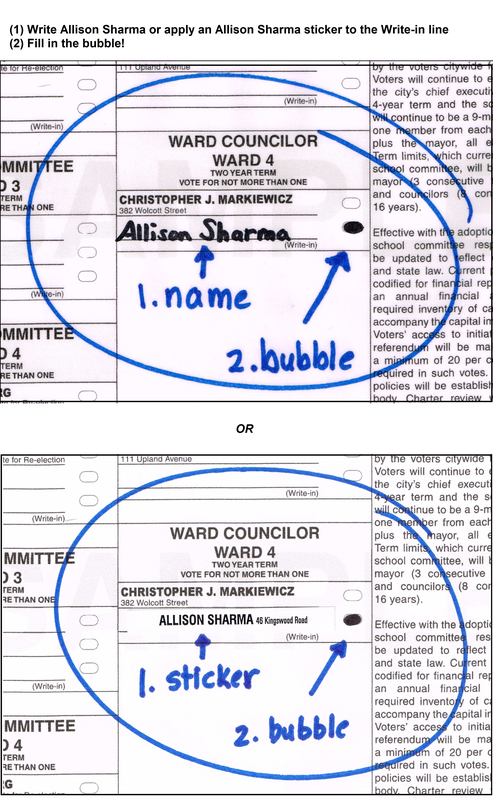 If you live in Ward 4 but are unsure of your voting location (either Burr School, Williams School or Lower Falls Community Center), use the Mass Secretary of State’s easy, online form to find out where to vote.